In the “When & Where” section, “Illinois” has been removed from the list of states. In addition, references throughout the release, headline and in the photo captions should read: …in 20 states (instead of …in 21 states). T-Mobile is all in for LGBT Pride. Over the coming months, America’s Un-CarrierTM is celebrating historic progress in marriage equality and equal rights for the lesbian, gay, bi-sexual, and transgender community by supporting and participating in LGBT Pride events in 20 states across the country. T-Mobile, along with our Diversity & Inclusion program and Pride & Allies Network, will have a strong presence at LGBT Pride events – ranging from ‘Magenta Marchers’ to creative floats to title partnerships – all with the goal of celebrating diversity and love in all its forms. In addition, this year, T-Mobile also launched 23 Diversity & Inclusion chapters in 20 states – bringing this important work to life at a local level. These D&I chapters provide local opportunities to drive inclusion efforts and activities most important and relevant to each area. Throughout the year, T-Mobile – together with the D&I Pride & Allies Network – will take part in 22 LGBT Pride events in 20 states, including: Alabama, California, Colorado, Florida, Georgia, Idaho, Indiana, Kansas, Maine, Missouri, New Jersey, New Mexico, New York, Ohio, Oregon, South Carolina, Tennessee, Texas, Virginia, and Washington. T-Mobile supports individuality and equality. 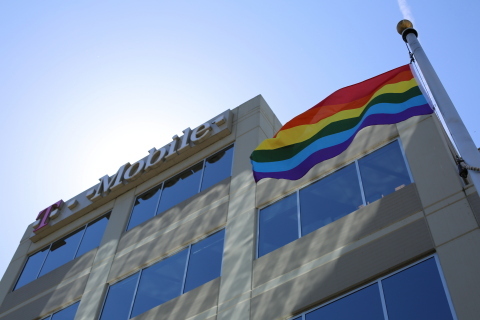 And together with our very own employee-based Pride & Allies Network, we’re continuing to build critical awareness around issues important to our LGBT employees and customers, letting everyone know that T-Mobile is a great place to work and do business regardless of your sexual orientation or gender identity. T-Mobile supports a culture of inclusion and accomplishment where you can bring your full self to work. We are proud to be recognized by the Human Rights Campaign (HRC) as a “Best Place to Work” with a perfect 100 score on the Corporate Equality Index. By embracing diversity and promoting inclusion, we become a stronger company, allowing us to better connect with and serve our customers.